This was the first long exposure shot I really liked from the ones I took in Berlin at the GPlus Euro Photowalk. It was taken on the first day I arrived there, before having even met anyone from the photowalkers. The clouds were absolutely glorious that evening. I remember I was jumping up and down, laughing by myself seeing them as they were coming from behind the building and people at a cafe nearby were looking at me then looking at the building and the sky, then again at me and smiling somehow condescendingly, somehow curious… Maybe they were thinking that I had a vision. Which, by the way, was right. In another way than they were probably thinking, but right. This is the Jannowitz Center, situated right next to the Jannowitzbrücke, and I stumbled upon this building by pure chance, as I was looking for another one and kind of got lost. That’s why I love to get lost, every time I find something interesting I didn’t know of. I never found the other building, btw. I was in a wrong neighborhood anyway. This is only a small part of it, but this building is very large. It’s a commercial center and it has a lot of the elements I like to play with when designing a building myself. First of all, irregular shapes and volumes that intersect each other, different textures and materials put together and a lot of transparency that gives you the possibility to explore how the spaces work with each other. As for the photography part, it has a lot of interesting angles, but I only took this one. I knew from the moment I saw it that this was MY angle. Thank you Berlin for being such an amazing city and for being the perfect background for meeting the wonderful people I met there. 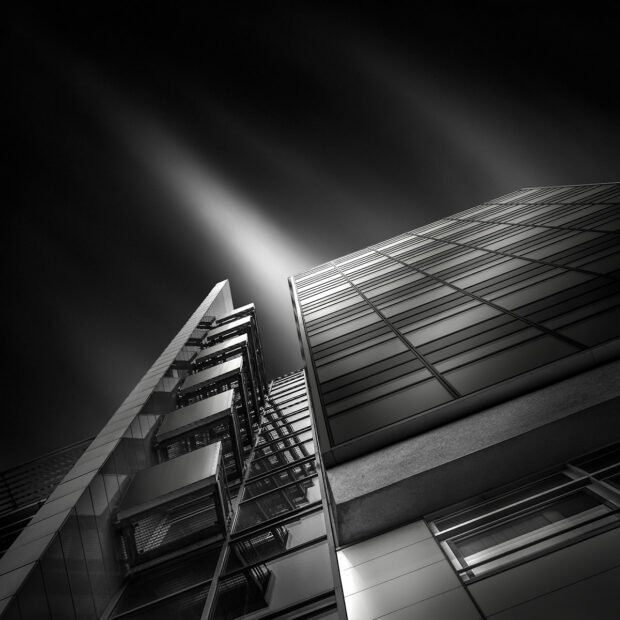 Posted in Architecture Black and White Fine Art. RSS 2.0 feed.